View Image Gallery of Tribe Nygmiini n.
Arna bipunctapex Hampson comb. n.
Somena bipunctapex Hampson, 1891, Illust. typical Specimens lepid. Heterocera Colln Br. 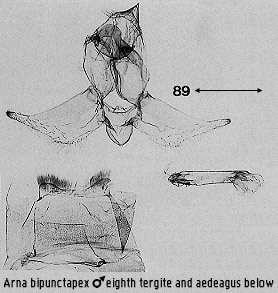 Euproctis bipunctapex Hampson; Holloway, 1976: 46. Diagnosis. The forewing facies has two black dots in the yellow apical patch and an immaculate yellow patch at the tornus. Taxonomic note. Schintlmeister (1994) included A. atomarina van Eecke stat. rev. & comb. n. (Java, Sumatra) as a synonym of bipunctapex: it is distinct, though closely related. The hindwings are entirely pale yellow without grey shading, and the greyish projection between the marginal yellow patches of the forewing does not reach the margin. The uncus is less acute and the valves are less produced apically (Fig 92). Geographical range. Indian Subregion to Taiwan and Sundaland. Habitat preference. The species has been taken from the lowlands to 1620m, but is possibly more common in the lower montane forest zone in the region of 1000m. Biology. 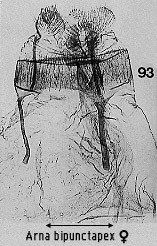 The larva was described by T.R.D. Bell (MS) and illustrated by Wang (1993). It is pale brown, with narrow white dorsolateral bands and a slightly darker brown dorsal line. The secondary setae are long, white. There are conspicuous oval black marks dorsally on slightly raised areas of the first two abdominal segments, and in later instars the dorsolateral rows of verrucae are also distinctly darker, together with a squarish black patch dorsally towards the posterior. 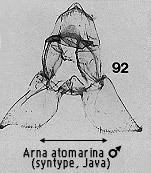 Bell (MS) indicated that the tubercles on A1, A2 and A8 were formed by the coalescence of the subdorsal pair of verrucae on these segments. The verrucae are black, with sessile, star-like white scales or hairs, and bristle-like white setae. He described the colour as yellowish greenish with a subdorsal white line and a similar lateral one, with weaker ones in supra- and subspiracular positions. The thoracic and subspiracular verrucae are more orange. Bell noted the larvae were gregarious throughout their existence, living and feeding closely packed together: the illustration in Wang supports this. Pupation is in a tough, thin, closely woven, light brownish-yellow cocoon, spun amongst leaves or in a bark crevice. Wang referred to hosts in the families Ebenaceae, Elaeocarpaceae, Euphorbiaceae (Sepium), Hamamelidaceae, Lauraceae, Moraceae, Oleaceae, Rosaceae and Theaceae. Other records (Bell; Pholboon, 1965; Hutacherern & Tubtim, 1995; unpublished IIE records) are: Terminalia (Combretaceae); Shorea (Dipterocarpaceae); Careya (Lecythidaceae).